Composed by Howard Pancoast. This edition: 2 copies included. 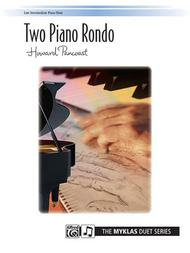 Duet or Duo; Piano Duo (2 Pianos, 4 Hands); Solo Small Ensembles. Early Advanced level piece for the Piano Duo event with the National Federation of Music Clubs (NFMC) Festivals Bulletin 2008-2009-2010. Sheet. 24 pages. Alfred Music #00-88211. Published by Alfred Music (AP.88211). This challenging late intermediate piano duet for two pianos, four hands is energized by syncopated, accented chords over eighth-note octaves. It is in the key of A minor and 4/4 meter, with a quieter section featuring a triplet pattern. Two copies of this 12-page piece are included.